Sourdough Saga: Episode 3 – good things come to those who wait! A week ago, and with a certain amount of frustration, I stashed a very promising looking sourdough starter in the refrigerator, knowing I didn’t have a plausible baking day for another seven days. Despite having lots going on, those seven days have been torture, in their way. I’ve not looked forward to a day off quite so much for a very long time! On Tuesday morning, in preparation for today’s much longed-for baking day, I ‘rescued’ my jar of starter from the fridge. It had ‘fallen’ back from it’s bubbly heights and seemed more like a pot of goo than a bubbly ferment. But I’d been expecting this. I gave it a couple of teaspoons of fresh flour just for a small snack, something to munch on while it warmed back up to room temperature, and went to work. Some promising bubbles greeted me on my return, so Tuesday night it got a proper feeding. This had the expected – but gratifying! – result of a decent doubling in size by Wednesday evening. Pleased that the starter seemed nice and active, I constructed my ‘overnight sponge’ on Wednesday night. The recipe for my first sourdough loaf is a slightly modified version of one of the sourdoughs in ‘River Cottage Handbook No.3 – Bread’ by Daniel Stevens (ISBN 978-0-7475-9533-5) which has been staring at me accusingly from between it’s very beautiful covers since it first moved onto my kitchen book-shelf a couple of years ago. These are mixed by hand in the bowl, covered loosely with cling film, and left to ferment overnight. 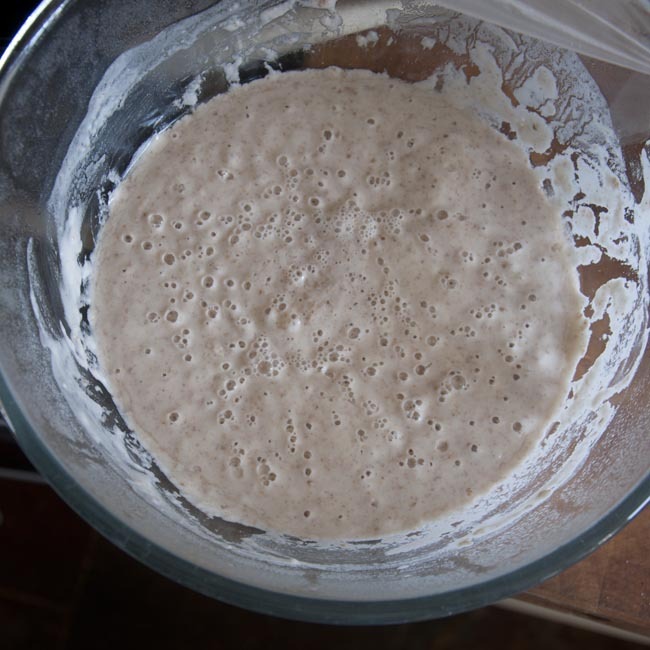 This morning, after I couldn’t bear to stay in bed any longer out of curiosity for how my bread was going, I was met with this – a lovely bubbly bowl of promising things! I put the coffee machine on for my essential morning brew. So distracted was I by my marvellous bubbly sponge, the jug was half-way full of pale brown water before I realised I’d forgotten to add any ground coffee! The sponge, when I stirred it and then poured it off into a second bowl, was an amazing ‘stringy’ consistency, more like melted cheese than anything I’ve encountered in bread-making before – I assume in some way from the alchemy of the microorganisms within it. After mixing the sponge, flour and salt roughly by hand, I put the lot into my (rather lightweight!) stand mixer, dough hooks fitted, and started it going. It certainly gave the dough (and itself!) a heck of a work-out. After a couple of minutes I added a good glug of olive oil and left it to work for about ten minutes. 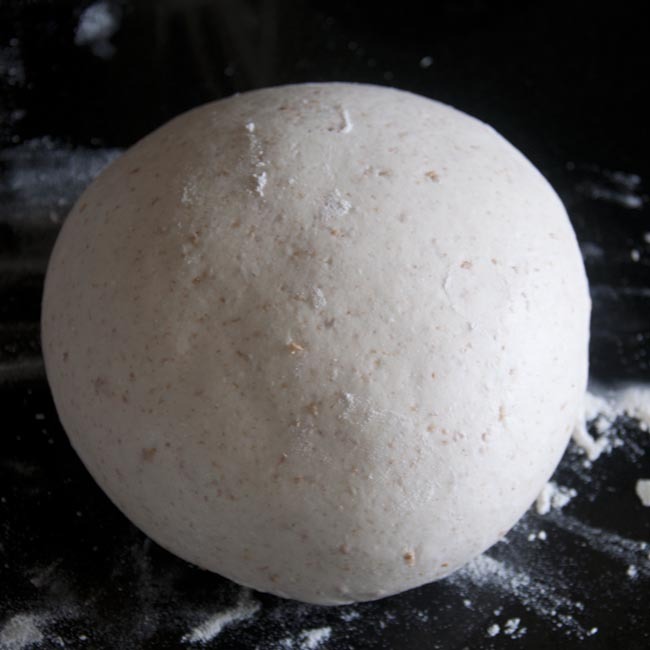 I was told to expect quite a wet dough and certainly this was tricky to handle, sticky and rather ill-manered! 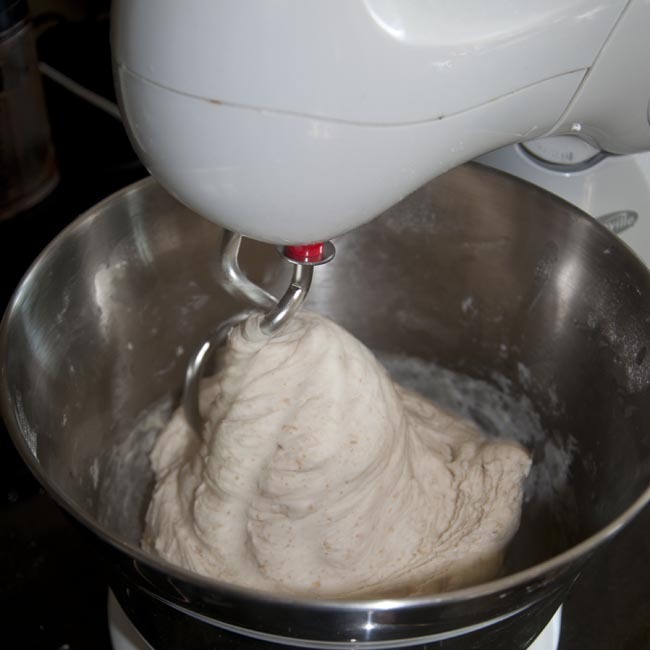 I don’t have a dough scraper so I was rather grateful for the mechanical assistance – though I’m not sure how many batches of sourdough my stand mixer has in it, it seemed to find it quite an effort! 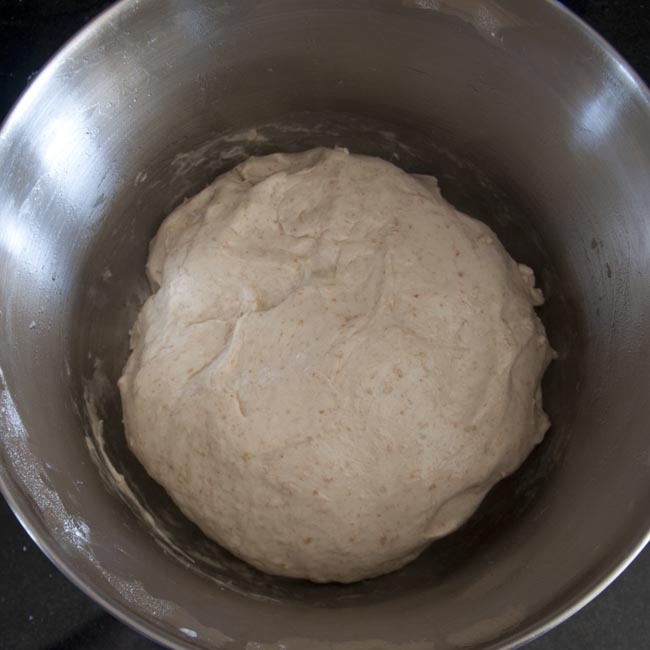 After kneading, I formed it into a rough round and oiled the bowl before setting the dough in it to rest for the first time. Before this first resting period it looks like this, and after a couple of hours, to be honest, it looked just the same, if possibly *slightly* bigger in the bowl. 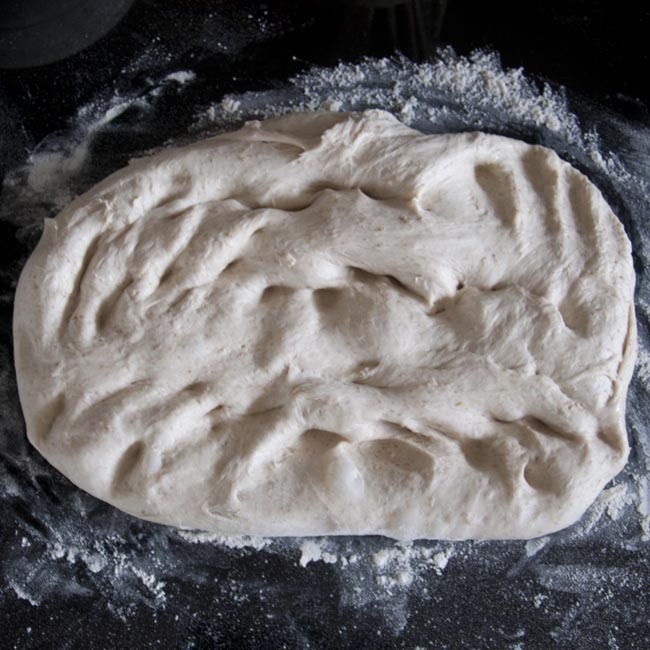 Flour your surface, and then turn out the bowl of dough – squash it out into a rough rectangle with your fingers, and then ‘knead’ it gently back into a tight round before returning it to the oiled bowl for another hour or so. Put the bowl somewhere warm, but not hot – on a cool day, the oven with the light (but no heat!) on makes a good resting environment. You’re going to repeat this process of resting, flattening and re-forming your ball a couple of times during the day. A couple of hours before my planned baking time, I turned the dough out for the last time. It’s springier, silkier and lighter, with some noticeable bubbles now when you handle it. Form it into a round again but this time, rather than returning it to an oiled bowl, it would rather be in a proving basket. I don’t have one of those, so I used a mixing bowl lined with a clean tea-towel which I’d dusted generously with rye flour. I had very little faith that this was going to result in anything other than a disappointing sticky mess when the dough adhered to the cloth, but I’m a good girl and do as I’m told. Covered loosely with a piece of cling film, I left this patiently for another three hours. I’d read all sorts of advice about the critical baking process – involving dutch ovens (I don’t own one), squirty-bottles of water (likewise!) for steam creation, and even things that look a bit like chicken bricks to approximate a traditional wood-fired oven. 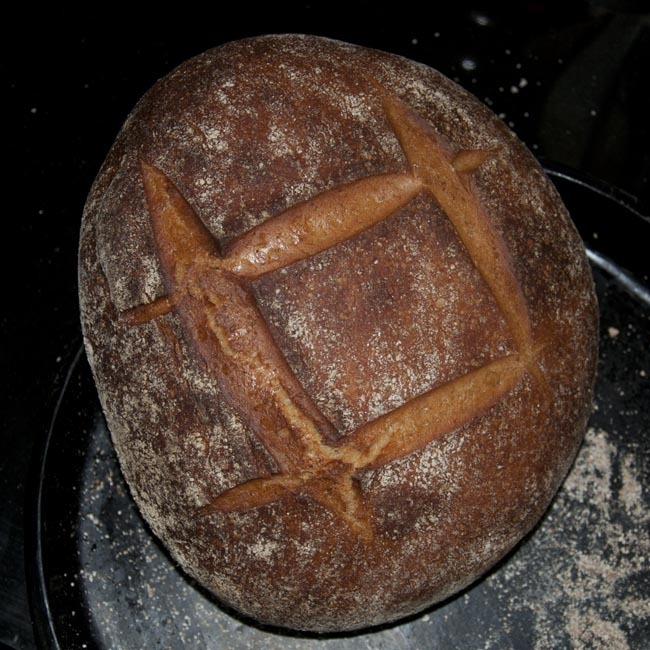 I went with what I actually had – a round black stoneware baking dish for the bread, and a stainless steel roaster to hold some water in the bottom of the oven. I heated it up to it’s maximum temperature (230C on the dial – 20 below what was recommended) and pre-heated the stoneware dish. Once it was all up to temperature, and after adding a kettle-full of boiling water to the roaster in the bottom of the oven, I tried to gently turn out the floured dough onto the baking dish. It seemed like a bit of a disaster, to be honest – ending up rather crumpled and misshapen. I cut a cross-hatched pattern crudely into the top, and reassuring myself it was all about the flavour, bundled it back into the blasting hot oven. I couldn’t tear myself away from it, and ended up sat cross-legged on the kitchen floor peering through the oven door as a miracle started to happen. First the crumpled side seemed to stretch itself back into shape, and then, I’ll be damned if it didn’t start to rise! Ten minutes into baking and I turned the oven down to 190. The amazing rising act continued – first, it stretched its way languorously into the slashes, stretching them nicely across the surface. And then, it started to climb vertically upwards, lifting its edges off the baking tray. I’ve never seen a loaf perform an act like it – I can only assume it’s the result of the clever changes to the gluten that result from the extended rising and proving time. It was like something out of the Incredible Hulk. After 40 minutes the crust was a lovely warm mid-brown colour, but the bottom was still a bit soggy. I took it off the baking dish and returned it to the oven upside down for another 10 minutes. Hubby came home to find me stood expectantly in the kitchen. After that, I couldn’t wait any longer, and pulled it out of the oven. 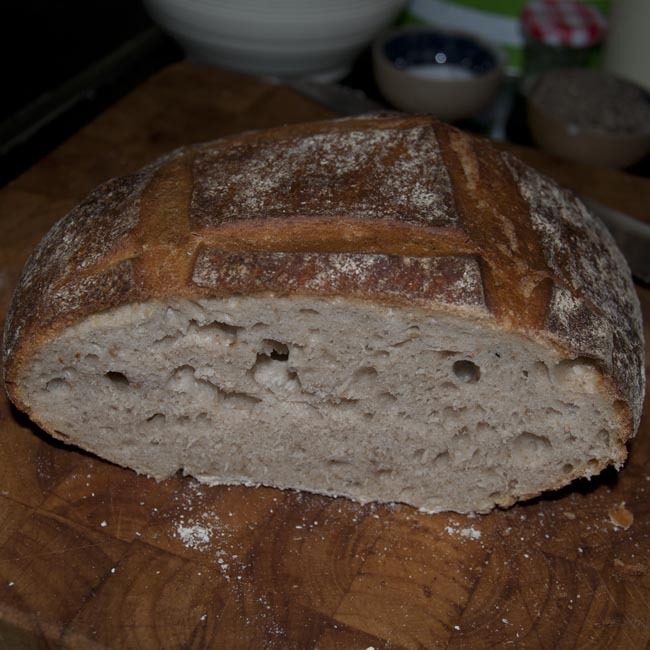 The smell of baking bread that filled the kitchen – and the house – was quite amazing. An hour later, we slice and sample it. I genuinely wasn’t expecting anything this good from my first effort. There are some lovely big holes in the dough, the crust is amazingly crisp but very thin – and retains a remarkable elasticity. The texture of the bread is springy and extremely satisfying. There is a definite, recognisable, but not overwhelming ‘sourdough’ flavour. I *adore* it. The whole process – from starting the sponge to eating the loaf – took about 24 hours, and I don’t regret one of them. The actual ‘working’ time today was about an hour and a half, and left plenty of time for popping to the shops, taking the dog for a walk, and so on. The bar for ‘good bread’ has just shot skywards in our household, and I suspect things may never be quite the same again. Congratulations! The problem now is that anything from the supermarket will now be a poor substitute! You’ll find it freezes well, once cool, wrapped in cling film. I make two at a time and freeze one so I always have a supply. cheers! I’m so sold on this stuff – it’s just the nicest bread ever – so much so it’s been the main event at dinner the last two nights! Have to make some more this weekend! How do you store yours when it’s not frozen? In a bread bin, paper bag, plastic or what? Will it work without the salt? Salt causes hypertension, causes stroke, heart disease, and so on. 7g of salt in this much bread is far too much. 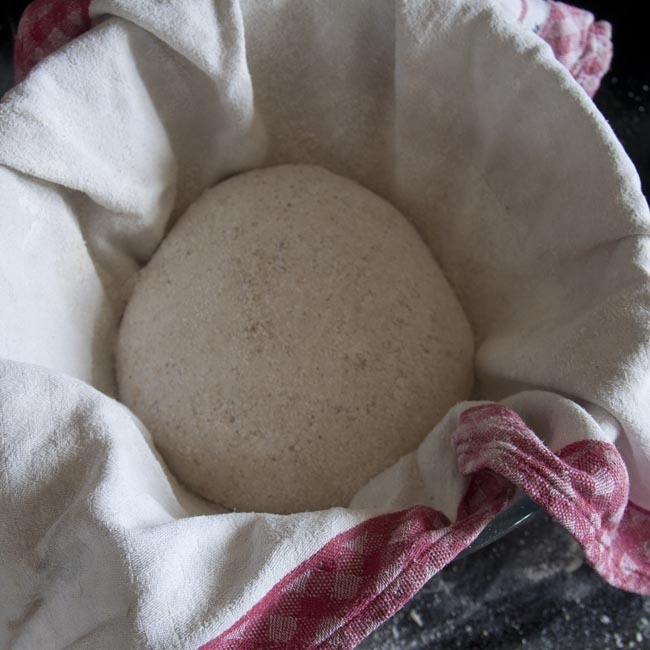 There seems to be a consistently ‘generous’ salt allocation in all the sourdough recipes I’ve seen, and certainly some sources claim it’s essential, though I’ve not been digging to understand the supposed mechanism yet. 7g is actually a modification downwards from the source recipe which wanted 12.5g – I just couldn’t bring myself to do it! 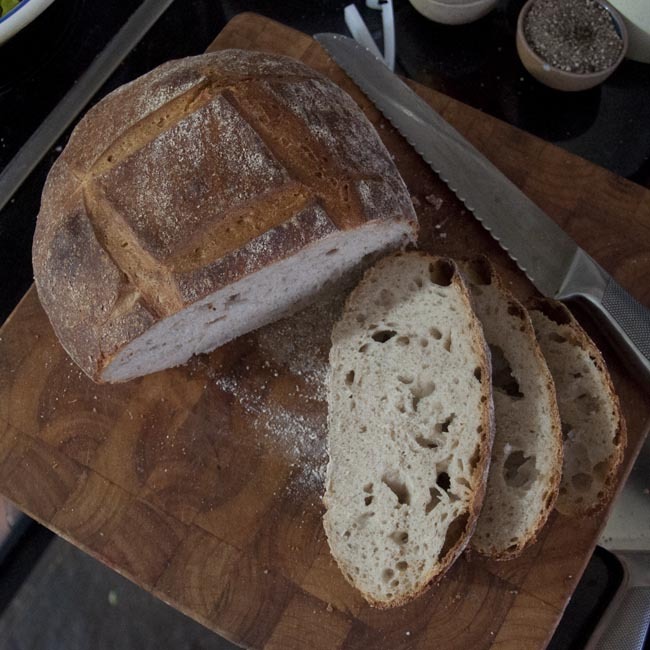 Perhaps one of the more experienced sourdough bakers reading can give us more information?